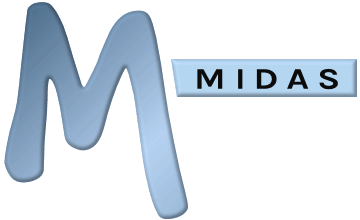 MIDAS can send email in a couple of different ways, either using "Sendmail" (if available on your server) or by using your own SMTP server. Not all servers support Sendmail, therefore it's recommended that you specify your own SMTP server for sending email where possible. Your network/IT administrator should be able to provide you with the correct settings to enter for your organization's SMTP server. If you are a MIDAS user with sufficient permissions, you can check the email/update address associated with your account via MIDAS Admin Options → Manage Users & Permissions. If you do not have access to this, you will need to ask your MIDAS administrator to do this for you. If you are a client, please check with your MIDAS administrator that your current email address is recorded on your client record. It is important that client's have an email address associated with them in order for MIDAS to be able to send notifications on the status of their booking requests, etc. For administrators, the easiest way to add/update a client's email address is to locate the client via the "Search" function of MIDAS, and then click the corresponding "Modify Client" icon. If the mail sending settings (see item 1) are correct, and your email address within MIDAS is correct (see item 2), and you're still not receiving expected emails from MIDAS, then it's highly likely that somewhere in the pipeline, the being sent by your MIDAS emails are being incorrectly deemed as spam. This could be occurring within your email software (Check your spam/junk folder), or on your wider network (which your network/IT administrator should be able to check for you). Check that the address you're trying to send email to isn't the same as the email address that email is appearing to be sent from. For system generated notifications, emails will appear sent from the address specified in the "MIDAS Generated Emails Appear From" setting. However, for other outgoing email these may appear sent from the email address associated with the user account which initiated the action. An example of this are booking confirmation notifications. These will normally appear sent from the email address of the user account who added/approved the bookings. For example, if you're a user adding a booking for yourself as a client, the email address associated with both your user account and client record within MIDAS is likely to be the same. As such, booking confirmation emails destined for your email address will appear sent from that same email address, and may therefore be more likely to be flagged as spam by your mail system/client. If you're currently sending email via the "Sendmail" option, switching to use your organization's own SMTP server/relay for sending mail from your MIDAS booking system instead can greatly reduce the likelihood of outgoing emails from the software being identified by mail servers/relays and ISPs as junk. It's also worth checking that your organization's domain has a correct SPF (Send Policy Framework) record setup to allow the relaying of email from your MIDAS system. If your orgnaization's domain's SPF record is set to block the relaying of email from outside your organization or from the server where your MIDAS system resides, then email will not be allowed through.